The E-traction system made an appearance in holographic form at the CUTA 2018 show. CUTA 2018 was held at the Toronto Convention Centre. 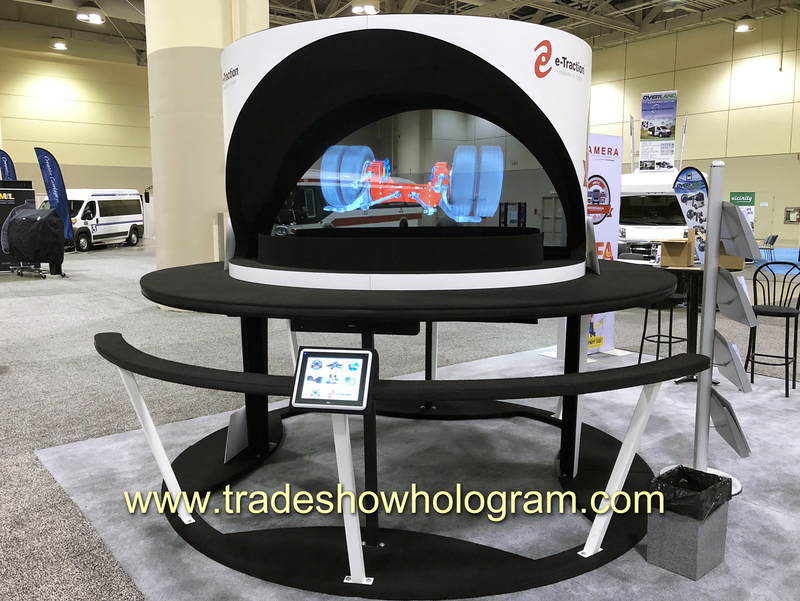 The interactive dual sided large hologram projector offered trade show visitors a variety of 3d holographic presentations. Visitors can activate each hologram with a fingers touch of the interactive touch screen. The display projects full color video projections up to 3 ft tall and 5 ft wide floating inside the 7 ft wide chamber. Viewers watch presentations on each side of the display at the same time without either presentation interfering with the opposing side. Large Hologram projectors prove popular at attracting visitors to a booth. It also delivers a sales presentation in an effective and memorable fashion. The trade show exhibit is also available in a standard sized version. The new e-Traction axle is projected in holographic form at a trade show.